The major gunmakers employed sharp-shooters for marketing purposes during the hey-day of exhibition shooting. One of those extraordinary shooters was Ken Beegle. Ken and his wife, Blanche, performed shooting shows all over the United States, primarily for Remington. 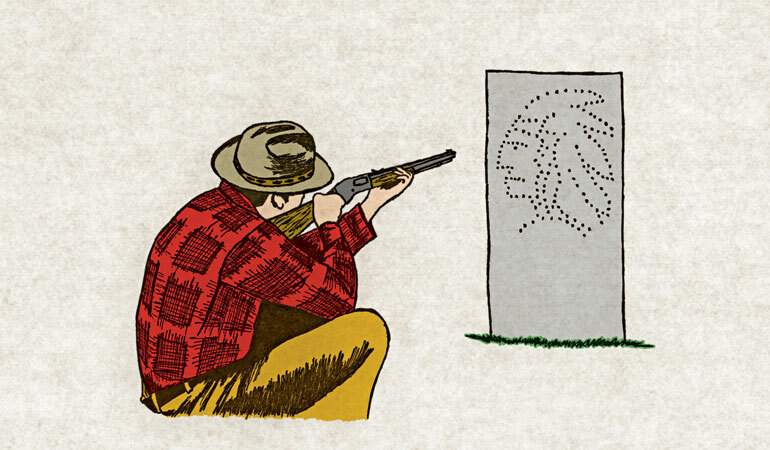 Ken was best known for his bullet portraits, which he “drew” using a .22 rimfire rifle. I have one. Being born in 1960, I never saw Ken per-form in person; however, I have watched a video clip of him on Fast and Fancy Shooters, a DVD I purchased years ago. Ken started exhibition shooting in 1925 and carried on for 35 years, retiring in 1960. He was an expert with rifles and shotguns. He taught Blanche to shoot, and she joined him in his shooting shows, often doing some shooting of her own. Her primary role, though, was to hold objects that Ken would shoot. She retired in 1958. Like other famous exhibition shooters, the Beegles often travelled to military bases during the World War II era, inspiring and instructing the servicemen. After World War II, they continued to tour through-out the United States. This excerpt from an article in the News-Chronicle of Shippensburg, Pennsylvania, on September 28, 1954, gives a good description of their act. “Ken Beegle, internationally famous marksman, drew a good crowd to the Shippensburg Fish and Game farm Saturday afternoon as he displayed the skill with rifle and shotgun that has made him so well known in shooting circles. “Mr. Beegle left a little memento of his skill behind, shooting out a perfect Indian head with a .22 rifle that will be displayed in the window of Parr’s Sporting Goods store on South Earl Street. The Parr store sponsored the exhibition by Mr. and Mrs. Beegle, a husband-wife shooting team working for Remington Arms. “Mrs. Beegle did only a little shooting herself, although that was enough to prove her skill at pop-ping off moving clay targets, but she showed her trust in her husband’s shooting ability by holding potatoes and bars of soap in her hand for him to shoot apart. “Mr. Beegle showed the operation of every rifle and shotgun in the Remington line and amazed the spectators with his ability to shoot eggs, oranges, and other small objects down after they were thrown into the air. He called for baseball players to toss eggs high into the air, then hit them at the top of the throw. The bullet portrait I own was given to me by my old boss, Gil Hebard. It is the head of an Indian chief, and it was made by Ken at a shooting club not far from my hometown of Knoxville, Illinois, in the early 1950s. Reportedly, Ken would make these portraits at a distance of about 20 feet, and they were fired freehand, meaning no lines were drawn on the tin sheet. My portrait has 200 perfectly placed bullet holes in it. Author and exhibition shooter Ernie Lind described how exhibition shooters made the bullet art. Here’s how it was done. After setting the tin for the bullet drawing in place, the shooter, usually using a low stool anywhere from 10 to 20 feet in front of the tin, would sit with the rifle mounted and supported by the elbows resting on the knees. Normally, two or more rifles would be used. The shooter begins shooting, and as the bullet holes appear, an outline forms, and the shooting continues until the design is completed. The shooter makes informative and interesting comments, sometimes comical in nature, as the empty gun is passed to the assistant and exchanged for a loaded gun. The firing rate was normally one shot per 0.75 second or less. According to some historians, Ken could draw a portrait such as this in less than two minutes. That sure is some fast and fancy shooting.